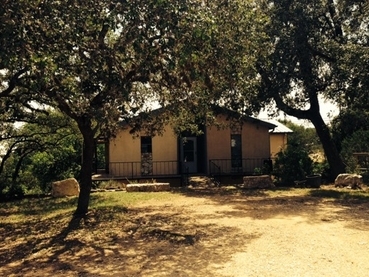 The Gnarly Goat House is a unique home nestled among the giant oaks, in a park-like setting, high above the Guadalupe River at the horseshoe. The Gnarly Goat House interiors have been created with high end, rustic, designer finishes. This quaint, cabin-like home features 2 bedrooms and 3 bathrooms, with linens and towels provided. The first bedroom features a single queen sized bed with a private attached bath. The second bedroom is setup with a bunkhouse layout with 4 queen sized beds. The open floor plan offers a fully-equipped kitchen and a great room, with a large sectional sofa, for entertaining friends and family. The living area is equipped with a 60”, internet connected HD television. WiFi connectivity is provided. Just through the back door is the deck, offering plenty of space for hanging out and having cocktails or grilling your dinner out in the clean, fresh, hill country air. You will love relaxing here with your family and friends and getting to the river without the hassle of driving and parking!